1.1 oz / 32 ml $21.15 ORGANIC. PART OF PLANT – Black Pepper Berries. 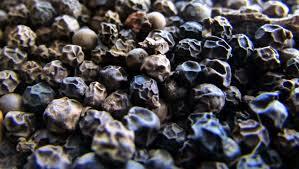 Painkilling – Warming Black Pepper is stimulating to circulation – use it for: muscular tension / arthritis / rheumatism / headaches / joint pain / menstrual spasm. Anti-cellulite – Its detoxifying, diuretic, & circulatory stimulation effects, combine to create a powerful anti-cellulite blend. Mentally stimulating – Apply this oil to neck and shoulders, while studying for exams, or any time you need a mental lift. Digestive stimulant – Black Pepper is the best Essential Oil for gas and digestive cramps. Special – There has been a lot of evidence regarding its ability to increase red blood cell formation. This makes it good for anemia, and as a general tonic. Precautions – Not for sensitive skin. / Do not use more than once a day, over entire body.